My laminator was still out from yesterday’s foiled card. I had recently bought a container of Deco Foil Transfer Gel. It is used with stencils. When it is dry, you put it through the laminator with foil. So, I flipped through my stencils and picked the shells. And I had this opal foil that I loved, but was not horribly successful with. The photo above looks a little “Meh”, doesn’t it? You can see it is shiny, the colors seem to fade on the kraft paper. BUT…catch it at an angle! Supplies: Stamp – Simon Says Stamp, paper – Neenah Classic Crest Solar White, Stampin’ Up! 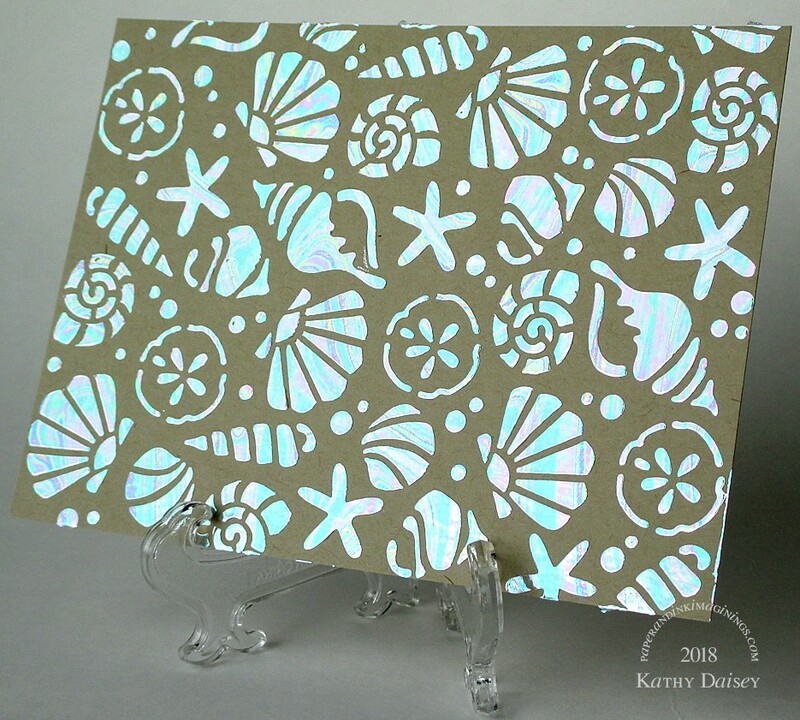 Bermuda Bay, Crumb Cake, ink – VersaFine Onyx Black, die – Lawn Fawn, stencil – Newton’s Nook, Deco Foil Transfer Gel – Therm O Web iCraft, opal foil – Therm O Web iCraft, embossing powder – Stampendous Detail Clear, organdy ribbon – Offray. Categories: card, encouragement | Tags: card, iCraft, Lawn Fawn, Neenah, Newton's Nook, Offray, Simon Says Stamp, Stampendous, Stampin' Up!, ThermOWeb, Tsukineko, VersaFine | Permalink. Offspring3 tasked me with making a card for a friend. I cut rectangles out of a Heidi Swapp MINC toner sheet (large enough to fit the butterfly die), and ran them through the laminator with various foils. After they were cool, I die cut the butterflies. Supplies: Stamp – Papertrey Ink, paper – Heidi Swapp MINC Toner Sheet, My Mind’s Eye, Neenah Classic Crest Solar White, Taylored Expressions Build A Scene, ink – VersaFine Onyx Black, dies – Impression Obsession (butterfly), Spellbinders (circle), foil – Heidi Swapp, ThermOWeb, embossing powder – Ranger Silver Pearl. Categories: birthday, card | Tags: card, Heidi Swapp, Impression Obsession, My Mind's Eye, Neenah, Papertrey Ink, Ranger, Spellbinders, Taylored Expressions, ThermOWeb, Tsukineko, VersaFine | Permalink. WOOT! I was able to foil something using my laminator! 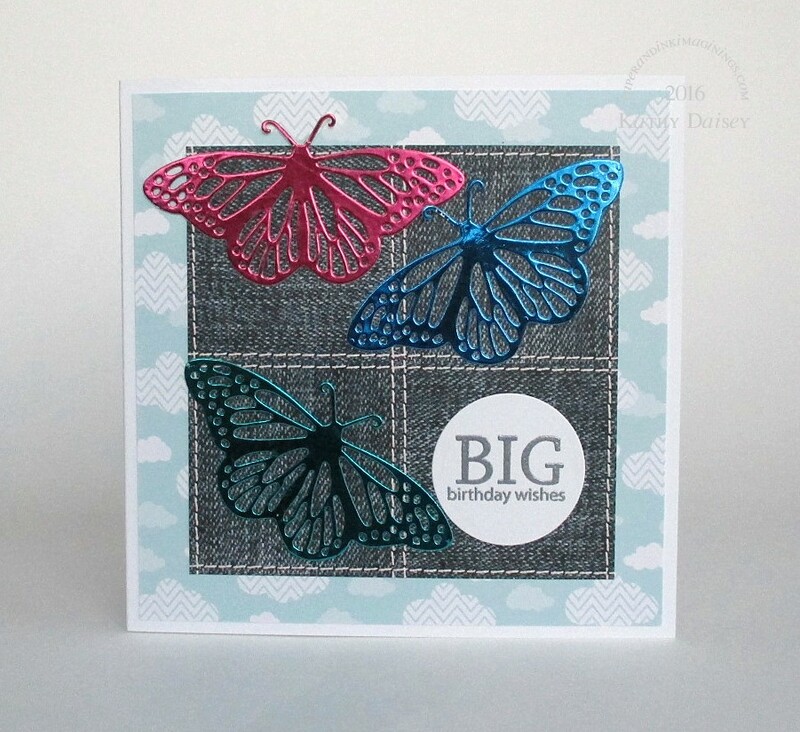 I stamped butterflies in Ranger Perfect Medium, and embossed with Ranger Super Fine Embossing powder. Then, I covered the butterfly layer with a piece of opal foil (ThermOWeb), and ran it through my laminator tucked inside of a folded piece of printer paper. Categories: card, encouragement, I love you | Tags: card, Hero Arts, Neenah, Ranger, Spellbinders, Stampin' Up!, ThermOWeb, Tsukineko, VersaFine | Permalink. Just back from a week at the beach, trying to get my crafting feet back underneath of me (and finish the mountain of vacation laundry!). I used an embossing folder to make the background for another project, and used an ink blending tool to spread Distress Inks (Mowed Lawn, Tumbled Glass). But, I decided it didn’t work with the original project. 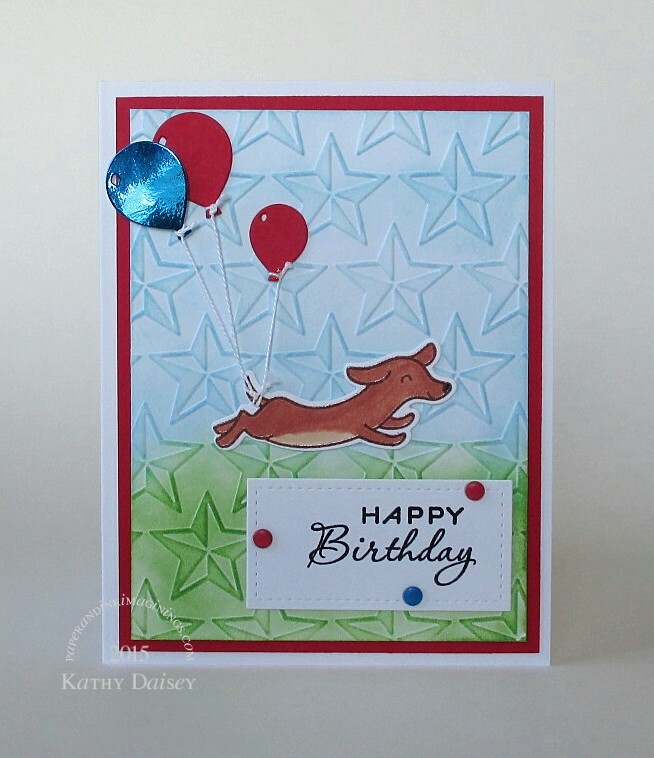 I think it makes a great backdrop for the excited dachshund and his balloons. I used my laminator, a Heidi Swapp MINC sheet, foil, and a balloon die to “make” a mylar balloon. Supplies: Stamps – Lawn Fawn, Papertrey Ink, paper – Heidi Swapp MINC sheet, Neenah Classic Crest Solar White, Stampin’ Up! Real Red, inks – Copic 110, E15, E53, Tim Holtz/Ranger Distress Ink Mowed Lawn, Tumbled Glass, VersaFine Onyx Black, dies – Lawn Fawn (dachshund, stitched rectangle), Taylored Expressions (balloons), embossing folder – Provo Craft, enamel dots – Stampin’ Up!, foil – Ocean Blue ThermOWeb, floss – DMC. 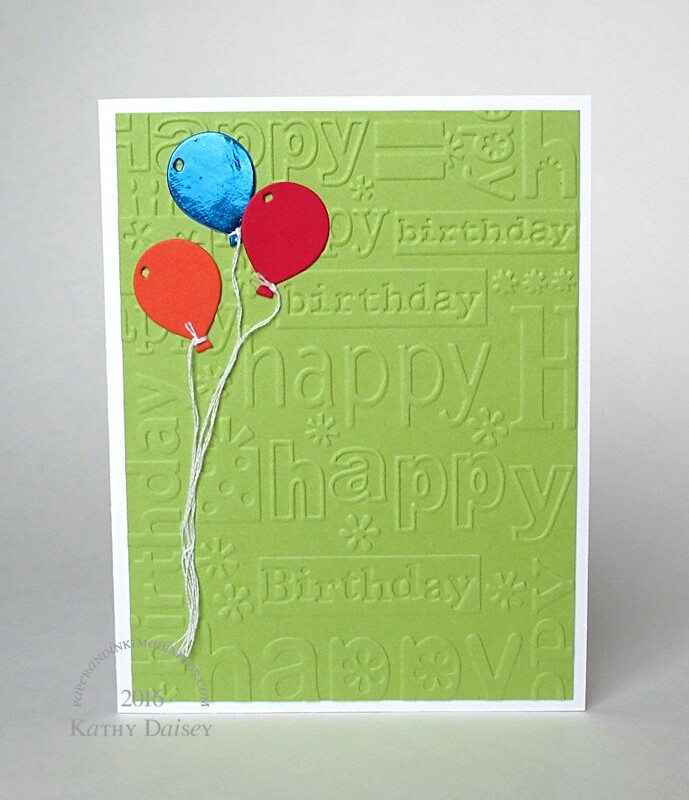 Categories: birthday, card | Tags: card, Copics, DMC, Lawn Fawn, Neenah, Papertrey Ink, Provo Craft, Stampin' Up!, Taylored Expressions, ThermOWeb | Permalink. I decided to pull out the laminator and try foiling something again. I picked a stamp with good solid lines (Marigold by A Muse Artstamps). I stamped with Ranger Emboss It ink, and used Ranger Super Fine Clear Embossing Powder. When that was cool, I sent it through the laminator with Ocean Blue ThermoWeb foil. The image came out much better than any I tried in the past – I think it has to do more with the type of image that I selected rather than anything else I did (or didn’t) do. I added a white embossed sentiment flag, and some baker’s twine. This card is small – 4.25 x 4.25 inches. Supplies: Stamps – A Muse Artstamps, Papertrey Ink, paper – Neenah Classic Crest Solar White, Stampin’ Up! Real Red, Tempting Turquoise, inks – Papertrey Ink Fresh Snow, Ranger Emboss It, foil – ThermoWeb, embossing powder – Filigree Fine Art Powder white, twine – MarkerPOP. Categories: card, thinking of you | Tags: A Muse Artstamps, card, MarkerPOP, Neenah, Papertrey Ink, Ranger, Stampin' Up!, ThermOWeb | Permalink. Yep. It happened. Where did that time go?? 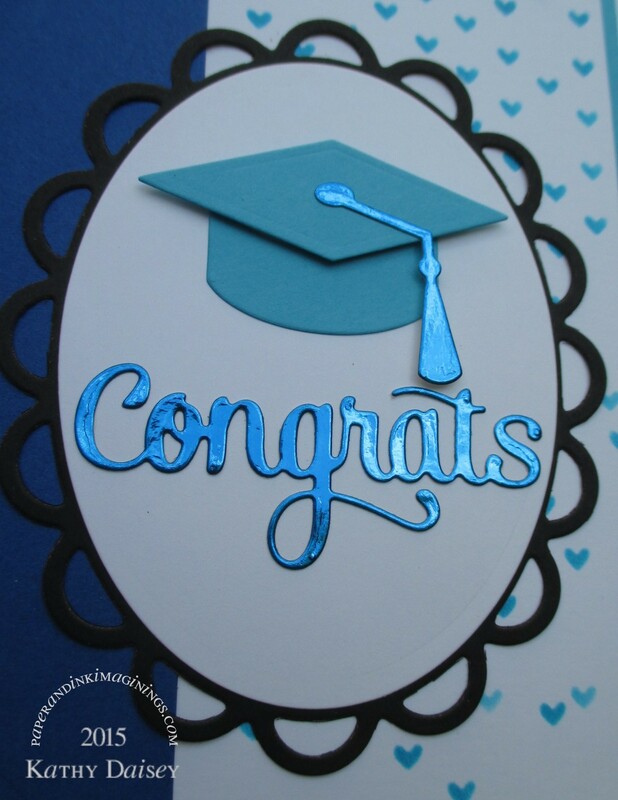 I was able to successfully use the laminator to attach some of the beautiful Ocean Blue foil to a Heidi Swapp Minc Sheet (cardstock covered in laser printer toner), and then die cut it with the word “congrats” and the tassle of the graduation cap. Supplies: Paper – Gmund Royal, Neenah Classic Crest Solar White, Stampin’ Up! Basic Black, Tempting Turquoise, ink – Stampin’ Up! 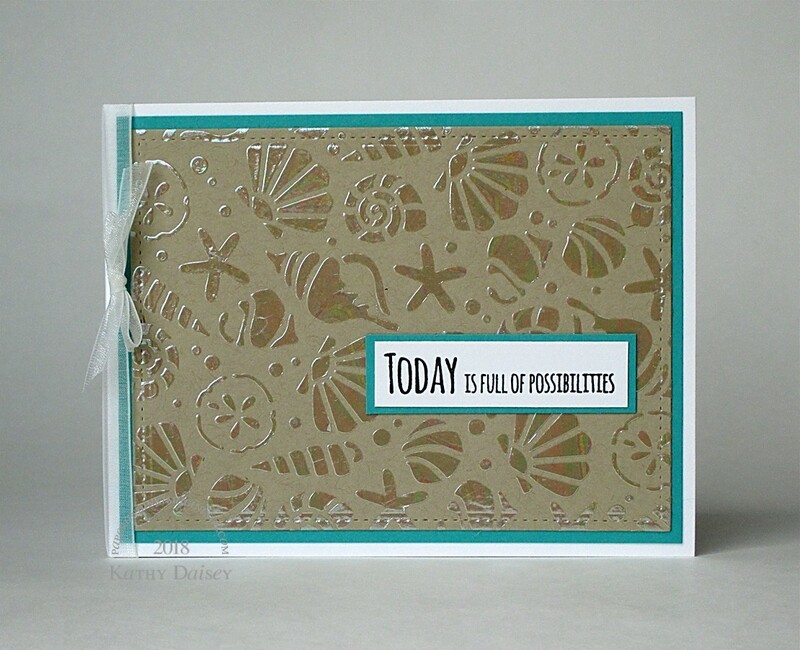 Tempting Turquoise, dies – Impression Obsession (word), Spellbinders (ovals), Taylored Expressions (cap/tassel), stencil – Simon Says Stamp, jewels – A Muse Twinkle Stickers, foil – ThermOWeb Ocean Blue, silver cord – PaperMart. 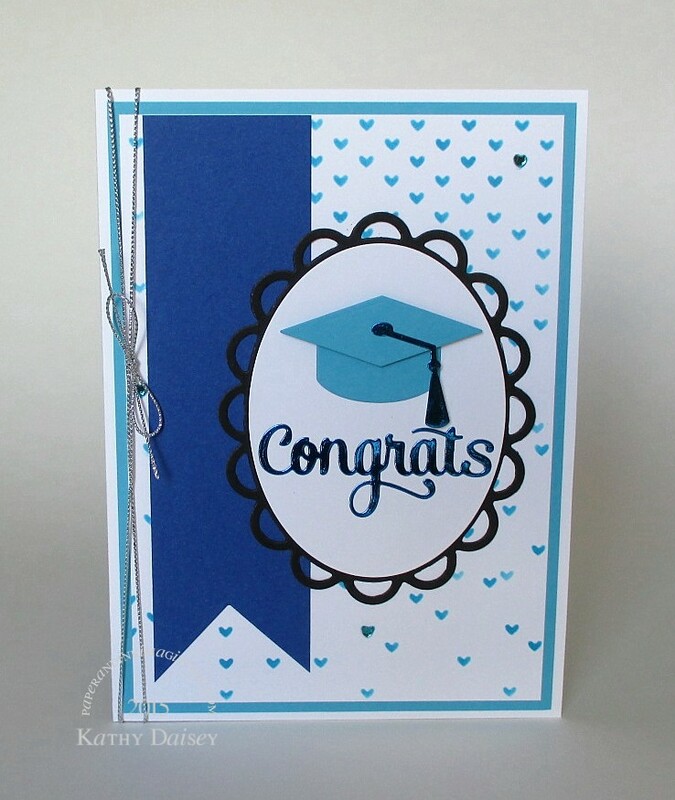 Categories: card, graduation | Tags: A Muse Artstamps, card, Heidi Swapp, Impression Obsession, Neenah, Simon Says Stamp, Spellbinders, ThermOWeb | Permalink.